Literary Eagle wrote: Thanks, Bagheera! And believe it or not, I still have one more Girlfriend of Steel 2 book left to review. I posted my forty-ninth review yesterday! This time, it's Shin Seiki Evangelion Koutetsu no Girlfriend 2nd 4 Koma Manga Gekijou #3, the third anthology of drawings and parody comics based on the Girlfriend of Steel 2 video game. Enjoy! Heeey, I translated some of the 4Koma from the Asuka/Ayanami Raising Project and GoS1 4koma anthology books back in...jeez, 2008? They're probably still on the Internets somewhere. Most likely they're even buried somewhere on the site, too. Those errors and exclusions are certainly annoying, so much for me getting Side A/B— I'll just get that artbook at some point instead. Tiny mistakes are totally understandable (pretty sure our MGSV Collector's Edition Piggyback guide has a few), but that many? Great to hear from you, SSD! Sailor Star Dust wrote: Heeey, I translated some of the 4Koma from the Asuka/Ayanami Raising Project and GoS1 4koma anthology books back in...jeez, 2008? They're probably still on the Internets somewhere. Ooh, that sounds fun! I love 4 koma. So cute and so hilarious. Sailor Star Dust wrote: Tiny mistakes are totally understandable (pretty sure our MGSV Collector's Edition Piggyback guide has a few), but that many? Yeah, I was rather shocked at the huge amount of mistakes in the English version of Side B. I'll still keep the English one in my collection, but when it comes to using the book for research, I'll stick with reading the French edition. I posted my fifty-first review today! This time, it's Neon Genesis Evangelion Photo File: Eve - Venus at the 2015 A.D., an image collection focused on six female characters from the Evangelion TV series. This book has pictures from the anime, photos of garage kits, and some of Yoshiyuki Sadamoto's art from the early planning stages of Evangelion. Check it out! That's some great work you have done there, Literary Eagle. Very helpful for someone who never bought any Eva books (except the manga) but would like to (like me). Only problem is, i have a lot reading to do, in order to find the right one! But i think i already have an idea . Cool, I hope you enjoy whichever book(s) you decide to get! I posted my 52nd review today! This time, it's Neon Genesis Evangelion Photo File 02: Adam - Soldier at the 2015 A.D., an image collection focused on the male characters from the Evangelion TV series (the female characters were covered in the previous book), plus some stuff about the Evas and Angels. It has pictures from the anime, some art from the early planning stages of Evangelion, productions sketches of Kaworu, and photos of garage kits. Check it out! The reviews are awesome, thanks for all the work you do with them. It'll help me to know which books should I buy in the near future, as I've been wanting to do it for a while now. Thanks! I'm glad the reviews are helpful, and I hope you have lots of fun with whichever books you end up choosing! I hope you enjoy the new review, and remember that if you missed any of my previous Evangelion book reviews, you can find the entire review list in the first post on this thread! Great to see you back! And then also with such a treat - super interesting stuff I'm very much looking forward to more, whenever you find the time again! Oh boy, I need to give these a read. Obscure Eva stuff reviewed by Literary Eagle? Count me in! robersora: Thanks for the kind words! You're always so nice and encouraging, and I really appreciate that! Squigsquasher: Cool, I hope you enjoy the reviews! Okay, I posted my fifty-fourth review! This time, it's the Evangelion: 1.0 You Are (Not) Alone Complete Records Collection, an amazing treasure trove of pictures and information about the Evangelion: 1.0 movie. This review is more image-heavy than usual, because there's so much stuff to cover. I posted my fifty-fifth review today! This time, it's the Evangelion: 2.0 You Can (Not) Advance Complete Records Collection, which has oodles of pics and info about the Evangelion: 2.0 movie, including a number of ideas that didn't make it into the final version of the film! It's pretty interesting stuff... and it's also pretty image-heavy again. (Sorry about that. I'll most likely get back to the "normal" amount of pictures in the next review.) Anyway, enjoy! That's only the beginning. That scene is discussed in more detail here, and at a few other places in the Rebuild forums. Literary Eagle wrote: robersora: Thanks for the kind words! You're always so nice and encouraging, and I really appreciate that! Did you buy the CRCs from Mandarake? I wanted to buy one them but I'm not sure how "average" is a "condition b" book. I've never gotten a terrible quality book from Mandarake. If there's a real issue there tends to be a separate photograph of the affected area. If you're not in any hurry though you might as well wait for a reissue. The last reissue was two weeks before Eva Q opened in theaters. Probably gonna do the same whenever Final shows up. That's really awful I'm really glad they cut that out, I get it Asuka's character is the one that gets really beaten up, she that wounded scared warrior so to speak but taking her face off really feels like one step to far as it more akin to the kind of horror scenes in bearfoot gen movie/manga where you see skeleton face's screaming and in the End of Evangelion when the mass Eva's tore her up you never saw the last seconds when they throw spears at her and cut her up its more implied. I posted my fifty-sixth review today! 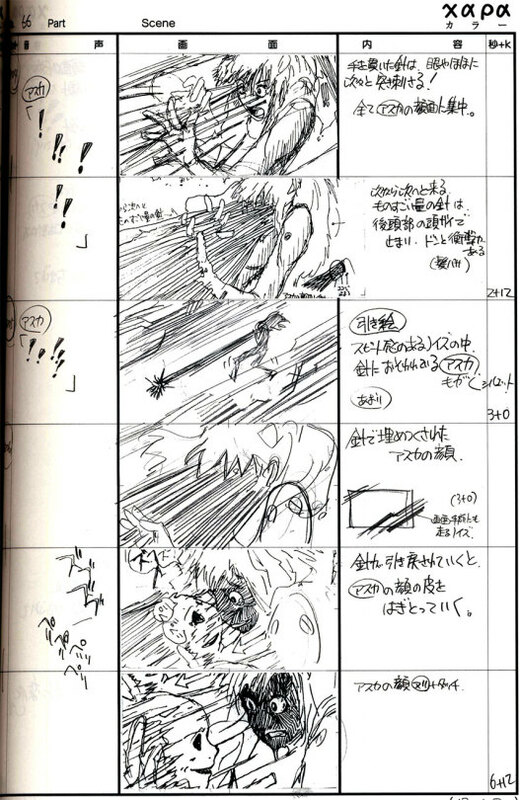 This time, it's Evangelion Shin Gekijouban: Q E-conte Shuu, which is devoted to storyboards for the Evangelion: 3.0 movie. This is a NEW BOOK that just came out this week, so I hope you enjoy the review! Oh wow, you already got yours? Mine just shipped from amazon.co.jp. Literary Eagle wrote: I posted my fifty-sixth review today! This time, it's Evangelion Shin Gekijouban: Q E-conte Shuu, which is devoted to storyboards for the Evangelion: 3.0 movie. This is a NEW BOOK that just came out this week, so I hope you enjoy the review! Thanks for the review and the information! I wasn't sure if this book would contain anything new or not, but the picture you posted of the missing cuts from the Fuyutsuki/Shinji conversation is interesting - Fuyutsuki appears to say that the Ayanami-type clone who brought Shinji to NERV, prepared as the provisional pilot of Mark.09, was an experimental prototype - number six - that has not had Yui's information transferred into it. Last edited by 1731298478 on Fri Feb 24, 2017 2:24 am, edited 1 time in total. 1731298478 wrote: Thanks for the review and the information! I wasn't sure if this book would contain anything new or not, but the picture you posted of the missing cuts from the Fuyutsuki/Shinji conversation is interesting - Fuyutsuki appears to say a) That the Ayanami-type clone who brought Shinji to NERV had been prepared as the provisional pilot of Mark.09, and b) this clone, number six, is an experimental prototype which has not had Yui's information transferred into it. Man, of all the things to cut! Thanks for sharing that, that's a tasty bit of information. Bagheera wrote: Man, of all the things to cut! Thanks for sharing that, that's a tasty bit of information. But it was cut, and so is arguably no longer canon. OTOH they may save the reveal for the last film (when we see the result of the uploading of the Yui information, perhaps?) - or maybe Anno just had another idea how to handle ReiQ and so left his options open. Having "Ketsuban" pasted over the actual images, rather than simply written in the Cut column like previous storybook books, is incredibly annoying. If we're going to pay for the storyboards, give them ALL to us -- don't cover some of them up! !